Tap the banner to go to the signup page for We Love Dreams, my free newsletter about dreams and their interpretation. You are barking up the wrong tree if you came here looking for academic books about dreams (though if you scroll to the bottom, I list some good ones). My dreamwork system, DREAMS 1-2-3, is the “anyone can do it” system. It’s practical, easy to follow, and keeps it real. I know all the theory and science behind dreaming and distill it down so it’s both understandable to a high schooler and enlightening for experienced dream enthusiasts. I must confess though that I have stealthily woven in the teachings of great theorists like Dr. Carl Jung, and the psychic Edgar Cayce. Most dreams are simple enough and don’t require a PhD to understand. Some dreams, however, plumb the depths of mind and spirit, and for them we open the guru’s toolbox. Step 1: Remember your dreams. It can be tough to do, but I provide plenty of tips and suggestions and show you why it’s worthwhile. Step 2: Interpret your dreams. It’s not as difficult as it can appear once you learn to look at dreams as stories told through symbolism. Step 3: Live your dreams by listening to their advice and applying it to your life. You make your dreams come true by practicing dreamwork daily. Along the way I teach you about nightmares and recurring dreams and provide a guide to symbolism. Then I top it all off by exploring some fascinating dreams I’ve had the pleasure of interpreting and providing examples from my dream life and the thousands of dreams I’ve helped interpret at Reddit Dreams and elsewhere. As I say in the book, your dreams are like the best life coach who lives in your head and knows what makes you tick, and best of all, speaks your lingo. The answers from your dream coach are personal and insightful. They motivate and enlighten. They point you down the path toward personal fulfillment and wholeness. Check out Dreams1-2-3.com , and read the awesome (and real) reviews at Amazon. 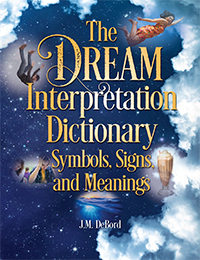 My second book about dreams and it’s an all-in-one dream dictionary, guide and encyclopedia. It might be the only book about dreams you ever need. I wrote it with my early days of studying dreams in mind, when I’d search for good sources of info and looked up my dream symbols. Back then, I wanted a book that not only gave definitions for symbols but also explains why they are defined that way and how they apply to my life. A book that teaches and explains. A lot of dream dictionaries masquerade as expert opinion. I don’t mean to throw shade at other authors but seriously, I can’t tell you how many times I’ve browsed through a dream dictionary and wondered how the hell do they come up with this stuff? The motivation that compels me is born from my early experience studying dreams and the desire to provide accurate information. I’ve been studying and interpreting dreams for almost 25 years and have reached millions of people with my teachings. I’m from Gen-X and have watched the collective interest in dreams peak during the 1970s and slowly decline as society drifted away from seeking truth and authenticity. Now we live in a world of fake everything, but we still have one source that’s always authentic and leads to individual and collective truths. The world is ready for a great revival of interest in dreams, and this time around we are led by some fantastic new teachers. See below for some of my recommended favorites, some classic, some fresh. Man and His Symbols, by Carl Jung. The classic introduction to dream symbolism and Jung’s theories. The Encyclopedia of Symbolism, by Kevin Todeschi. Kevin is a great teacher and his book is comprehensive. Dream Language: Self Understanding Through Imagery and Color, by Bob Hoss. Bob’s work is groundbreaking and based in science. The History of Last Night’s Dream, by Rodger Kamenetz. Rodger’s approach really honors the dream as an experience. Inner Work: Using Dreams and Active Imagination for Personal Growth, by Robert Johnson. An all-time classic. Wise Dreams: Subtle Messages of the Inner Self, by Rebecca Cleland. Rebecca is a fresh voice who uses her own dream life to teach people how to understand their dream lives. Dream Work (Book), by Jeremy Taylor. Link is to his books page. Too many to mention individually. He’s highly respected. Conscious Dreaming, by Robert Moss. This book opened me up to the deeper layers of dreaming. Dream Like a Boss, by Ryan Hurd. Well-sourced and comprehensive, it covers advice for better sleep and better dreams. The Dreams Behind the Music, by Craig Sim Webb. As a music fan, I love this book. Creative Dreaming, by Patricia Garfield. Link is to her online bookstore, she has so many titles. Such a widely respected source of wisdom and knowledge. Power Hunch, by Marcia Emery. Tapping intuition through dreams. Stop back soon for more recommended books about dreams.